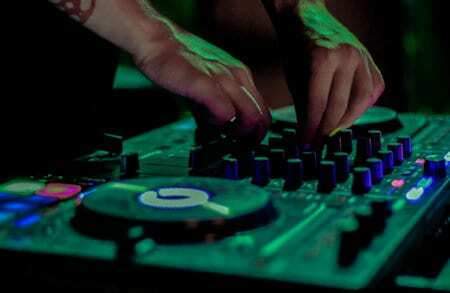 Find the best DJ controller for all of the different budget ranges listed and discover why number 12 has been the most popular choice for DJ's so far this year. A DJ controller will offer the best value for money when buying DJ equipment. Using a controller will save you having to buy separate decks and a mixer. They can offer simple digital mixing, and if you're a mobile DJ they're also a great space saver. Looking for the best DJ controller can be a hard task, but many top clubs now expect DJ's to take their own controller to play their set. This means an easy to carry, reliable controller is essential for all DJ's. But with so many different brands out there, how do you know which DJ controller is best for you? I've laid out a list with the top 10 best DJ controllers on the market. These controllers will suit a range of different budgets and skill levels. This article contains controllers starting from less than $100 so there is something for any budget. 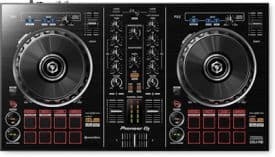 Each controller overview will help you to find the best DJ controller for your your budget, while still offering all of the features you will need as a beginner or experienced DJ. This is the best value for money controller and the best DJ controller for under $300. I've always recommended Pioneer DJ equipment as it simply offers awesome build quality and is built to last. 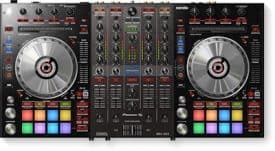 Beginners or more experienced DJ's will enjoy the Pioneer DJ DDJ-RB which comes in at a quite unbelievable price for what is offered. I've used it a lot and it really is a true workhorse. It will suit club, mobile, or bedroom DJ's with its many awesome features. It comes bundled with Pioneers amazing Rekordbox software. But will also work great with most other programs like virtual DJ etc. When you receive the controller you can simply download the full version of the Rekordbox software and use the included activation key. If you're unfamiliar with Rekordbox or any other digital DJ software, it basically lets you play music directly from your computer. You will use the controller to control the mix as it works in conjunction with the software. The Pioneer DJ DDJ-RB has a built in soundcard, so simply plug and play via the USB port on your computer. The controller itself has an uncluttered 2 channel mixer with a 3 band EQ and trims. It also offers high pass / low pass filters, music library browsing controls, and separate channel VU meter to keep your levels in check. The rotary knobs are OK, they don't feel cheap, but they aren't as nice feeling as the more expensive models. The deck features large 128mm jog wheels which feel great and responsive. Unfortunately these aren't illuminated like on higher spec models. But they are still touch sensitive and are just great for scratching. You'll get 8 performance pads that will control hot cues, loops, and add samples to your mix, plus a set of the usual transport control buttons. You'll have the option to beatmatch as you would traditionally, or the controller features a sync option to auto beatmatch. If you do beatmatch manually you should take the small pitch sliders into consideration as it can be tricky. If you're listening Pioneer, stop using those silly things!! 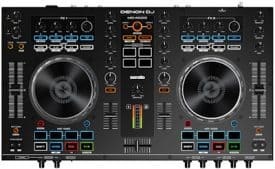 Small sliders aside, this would still be the best DJ controller in this list for beginners, and it would really grow with you. Or with it's more advanced options incorporating Serato DJ software, it could be used by more experienced DJ's who enjoy digital mixing. Because of it's size it is definitely recommended for mobile DJ's who need something smaller and easy to transport. And with it's lightweight plastic case it would be easy to carry to venues. Overall a nice little controller, but as it's so light you may experience the controller moving around when scratching. It might just be my heavy hands, but I have had this problem before. Hot off the shelf is the Pioneer DDJ-400 2 channel controller mapped to work alongside Pioneers Rekordbox DJ, and it's perfect for beginners! the DDJ-400 comes with a free license key for Rekordbox to get you mixing out of the box. It features a nice simple easy on the eye layout and is aimed at the beginner DJ just starting out. With all of the essential controls including a 3 band EQ with trims, and library browse and track load so you can keep your hands on the hardware and off the mouse. It also features responsive 5 inch super touch responsive jog wheels that let you scratch, spin, and cue tracks. 8 performance pads for hot cues, beat loop, beat jump, sampler, pad FX, and keyboard. It even has beat FX just like the ones on the flagship DJM mixers. One thing that I really like about the DDJ-400 is the fact that pioneer have listened to customer feedback and added longer pitch faders. If you compare the fader length to the DDJ-RB above you'll see what I mean. This means beginners will be able to get a more precise beatmatch just like using a more expensive controller. You'll also be happy to find a looping panel at the top just like on the expensive CDJ players, or higher priced controllers. Beat FX are selected inside the Rekordbox software but fully controlled on the beat FX panel on the mixer. Overall this will make a great first controller and with the more advanced controls like the beat FX and looping panel; you'll have an easier time transitioning to the club standard equipment when it comes time. This is Denon's lower priced option and is the best DJ controller for under $500. Denon are another manufacturer world-renowned for making quality DJ equipment. They have a reputation for quality sound, which I experienced for the first time back in 2001. 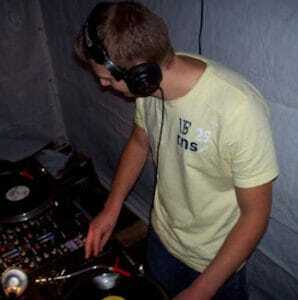 I wasn't even a DJ at that point, just messing with a friends setup, but I could hear it! So no surprise the sound quality of the Denon MC4000 is excellent. It has a built in 24-bit sound card for crystal clear mixing staying true to Denons reputation. Denon have built it to work perfectly with Serato DJ and it comes with Serato DJ intro as a free download. It also includes a voucher for 50% off the full version of Serato DJ when you're ready to get it. But it will also work fine with many other programs, including Traktor and Virtual DJ. The controller has some great functions and you can get really creative using the dedicated loop section. And, the really cool part is the sampler section.. There's four sample buttons in the centre with a sample volume control. This gives you instant access to the sampler for fast triggering, perfect for mobile DJ's who have lots of samples. There are more performance pads below the jog wheels that trigger hot cues and loops. You can do cue loops and loop rolls with a slip mode. The slip mode keeps the rhythm of the track while you are triggering loops to keep everything in time. It has dedicated FX controls on each channel and even microphone effects. You'll get long 100mm pitch faders for easy beatmatching, and touch sensitive jog wheels that are suitable for scratching. The jog wheels are great, they're perfect for scratching and feel very solid and well made. The 2 channel mixer has a 3 band EQ for clean sounding mixes. It also has separate high/low pass filter on each channel, and a sampler. The microphone will also add a little something different with its sound effects, and even has a second input. This second microphone could be used separately to the DJ's mic. This would be great for things like speeches at weddings and events for example. The MC4000 will suit the mobile DJ's that want a light, but robust controller that will last. It has a tough steel construction but still only weighs just over 4kg, and measures 55cm wide. It's also very easy to carry or pack into your car to transport to venues. So I'm sure you can expect long-term durability and many years of DJing fun. 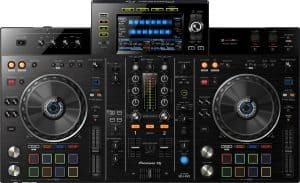 This is Pioneers upgrade from the successful DDJ-SX controller and is the best DJ controller for under $1000. The original SX was the worlds first controller to support Serato DJ. It was designed in partnership with Serato to offer intuitive control over the software's features. The SX2 continues to support Serato DJ and also works perfectly in conjunction with all of its features. One of the upgrades from the SX is that it now offers DJ's dedicated controls for the Serato Flip expansion pack. Serato flip lets you record and playback hot cue points and censor actions. So you can reorder and remix tracks, and block out swear words etc. This is done very simply in conjunction with the Serato DJ software. The controller features a record button to record your flip, a play button to play it back and a button to save it. The SX2 has also been upgraded to be Serato DVS ready. It offers the ability to connect CDJ's and turntables via the phono and line inputs. Using the DVS with control vinyl or control CD's will allow you to have a more traditional set-up alongside your controller. But you won't have to fork out hundreds of dollars on vinyl. All you'll need is two timecode vinyl/CD's to play any track in your library. Another upgrade is multi coloured performance pads as opposed to the boring all blue pads on the original SX. The Serato DJ software will allow you to assign certain colours to up to 8 hot cues, loops, samples or effects. This will let you access them at a glance using the corresponding colours on the pads of the controller. This removes any guess work and prevents mistakes during live performances. Stand out features on the deck section are large 132.5 mm aluminium jog wheels with an LED centre display that shows you cue markers. These Jogs feel great, they're super responsive and feel very chunky when scratching (which I like), and they work perfectly with Serato DJ. There's 8 colorful RGB lit performance pads per deck where you can color code your hot cues. This will help you to remember what hot cue is assigned to which button. There's also the usual transport buttons and a dedicated loop editing section. An effects section, a very handy needle search function, and more. The mixer section offers 4 channels with a 3 band EQ and filters. It's got the signature pioneer VU meters that are always longer with more LED's than the competition. And there's also a library search knob so you don't have to use your mouse or track pad every time you want to select a track. The crossfader is super light and has a curve control for those that enjoy scratching. The crossfader is also easily replaceable, so if you do a lot of scratching you'll have no worries about it wearing out. The Pioneer DDJ-SX2 comes highly recommended for DJs moving up the ladder, experienced, and mobile DJs. It's light enough to carry around at less than 6 kg. And at just over 66 cm wide can easily pack into your carry bag or vehicle. If you already own the original DDJ-SX that we mentioned earlier this is very similar. 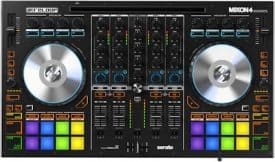 So an upgrade probably wouldn't be worth the money just to get the Serato flip and some colorful buttons. Numark are another manufacturer that has plenty of experience in the DJ game. They were the choice for my first budget set-up many years back! This is great reliable controller for beginners or even mobile DJs on a budget. It's also great for house parties or smaller venues. This makes the list for the best DJ controller for DJ's on a budget. This controller is built to work perfectly in conjunction with Serato DJ. It comes with the free Serato DJ intro version of the software and is upgrade ready. The Mixtrack Pro 3 offers a simple plug and play USB connection to connect to your computer or laptop. You'll also find a single pair of rca outputs for your speakers or amplifier. You can use the touch sensitive all metal jog wheels to nudge your tracks for beatmatching just like the more expensive controllers. And they are actually really good for scratching. They also have LED's that light up the platters for darker settings, and they look really cool! Using the performance pads you can set loops, auto loops, and samples. You also have a sync button to auto beatmatch, something to help out the beginners. Or you can use the long pitch sliders for the traditional method. The pitch faders were a bit tight to start with but they loosened up after a few days. Overall they feel pretty good and it's really easy to manually beatmatch using them. At the top you'll see the multi function touch strip that Numark are calling the strip search function. This lets you search for a certain point in a track with a single touch of the strip. The strip search also allows control over effects and their perimeters. The controller has no built in effects so they'll be chosen using the software, and then controlled with buttons and the strip search. The strip search is a good function, but I think it's a bit limited in its abilities. I'm sure Numark could have given it a few more jobs to do if they'd thought about it more. The mixer offers a 3 band EQ and a library search function to search your tracks. This lets you find your music and select it without taking your hands off the controller to use your mouse. You'll also find a microphone input to keep the mobile DJ's and aspiring MC's happy. And it has VU meters to keep those levels in check, something very important everyone especially beginners. Overall a simple controller, very light and transportable, and coming in at a great price. This controller will make the perfect setup for beginners, or aspiring mobile DJ's on a budget. The Reloop Mixon is my top choice for the best DJ controller for iPad and for DJ's that need iOS connectivity. It really is the ultimate iPad compatible controller. The controller has the ability to simultaneously charge your device while you mix. The Mixon 4 even has its very own docking station so that you can fit an iPad PRO (12.9'') directly onto the top of the controller. It is built to work in conjunction with either Serato DJ or with the Algoriddim Djay PRO software. It will also work with Traktor Pro 2 and Virtual DJ 8. The Algoriddim Djay PRO app can be downloaded directly to your iOS device. You can then mix using the app in conjunction with the controller. It will also work with Mac OS or Android devices. Stand out features of the deck section are very large jog wheels, which are very nice indeed, and colourful RGB performance pads. There's an auto sync button, key lock, and an effects unit. I mentioned this earlier with the pioneer RB, but something I never like are short pitch faders, which the Mixon 4 has!!! They do work really well but I just can't get to grips with beatmatching with short faders. It may be just personal preference but why Reloop??? You'll also see a loop control knob that has a light up meter below it to help you monitor the amount of bars you're looping. I thought that was pretty cool and it also works really nicely. The darker pads will allow basic transport controls, and there's a sync function. The lighter pads control hot cues, slicer, sampler, etc. The 4 channel mixer section offers a 3 band EQ with gains and filters. The channel filters will also work in conjunction with the effects function on the deck section with the touch of a button. This works great and is a combo I haven't seen before. It also boast separate channel VU meters, nice smooth and tight up faders, a loose crossfader, and more. Unfortunately there are no inputs to connect decks or external effects units so this is purely a software controller. But still great for Djs moving up the ladder, professional and Mobile DJ's. And perfect for those needing iPad or device connectivity. It weighs in at just over 5kg for easy carry and transportation. It's a solid feeling controller with a tough metal top housing that will last you many years. Another Pioneer controller that offers amazing value for money. This is a step up from the DDJ-RB in terms of features. And once again comes bundled with the pioneer Rekordbox software licence key. Simply download the Rekordbox software to plug and play using your computers USB port. If you already have software this will work perfectly with most other programs. This is another controller that I've personally used. It offers a more professional feeling control than the DDJ-RB. The controls all feel very solid and of a higher quality. But this is something you'd expect with the price difference. A little more complex than the RB but still fine for beginners looking for the best DJ controller to progress with. And great for more experienced DJ's. The mixer offers master VU meters and separate VU meters for each channel. A 3 band EQ with trims and low / high pas filters on each channel. It's a 2 channel mixer but it will easily let you switch between control of up to 4 decks from the Rekordbox interface. So 4 deck simultaneous mixing is possible, and it's fun too! Again, this controller has those small pitch faders that I despise! Some people like them, but I wish manufacturers would stop using them. Look how much space there is, would it be that hard to put bigger ones in Pioneer? With the tactile performance pads on the deck section of the controller you will have an extremely sensitive and responsive control. You can easily save up to 8 hot cue points. You can also create loops, samples, beat jump etc. Something very cool is the needle search that lets you use the touch sensitive strip above the deck to search for a track. Kind of like the strip search we mentioned on the Numark earlier, but this is better. This means you don't have to scroll through your music library using laptops track pad or your mouse. You can move your finger along the strip to find any part of a track with one touch. The DDJ-RR also offers awesome 24-bit sound quality and uses the same circuit for master and booth output as its big brother, the professional standard DDJ-RZ. The jog wheels are very large and have aluminium top plates. They also boast an LED illuminated centre with jog indicators. And at a decent size they're brilliant for scratching and feel bulky and kind of similar to the CDJ feel. Talking of CDJ's, if you'd like to add CDJ's or turntables to your set-up the DDJ-RR has phono and line inputs. This makes it a great Rekordbox DVS compatible controller. So the DDJ-RR would suit DJs moving up the ladder and the more experienced DJ. And with it's solid but professional feeling build will last you many years to come. At only 55 cm width and weighing just 3.7 kg mobile DJs will certainly appreciate the small size. This allows for easy transportation to and from your gigs. The colourful MC7000 is highly recommended for mobile DJs, experienced DJs, and DJs moving up the ladder. It comes in at a great price and is bundled with the full version of Serato DJ software to get you mixing instantly. Something very cool that stood out to me is that it has two USB ports allowing you to connect two computers. This lets two DJ's play together while both using their preferred software. Each computer can be controlled using a simple switch available on each channel of the mixer. This is great and makes playing back to back very simple, or ‘hand off’ with ease in a smooth uninterrupted manner. For the price of this controller you wouldn't expect this option. You'd normally have to pay much more. So this is the best DJ controller for back to back DJ's under $1000. Another great feature is the Key-Matching function, this lets you get the perfect harmonic mix. Most DJ's don't even think about mixing in key, but trust me, it will transform your sets. And the MC7000 makes it easy! There are no built in effects with this controller which I couldn't understand from such an otherwise feature packed controller. But at least the included Serato DJ software will provide effects that you can cue on screen and control with the unit. So not a total loss. The 6 inch touch sensitive jog wheels allow scratching when it's placed in vinyl mode. They also have rotational tracking LED displays that really stand out, andI must say they're pretty. You'll be able to add loops, samples, cues etc using the well lit RGB performance pads with colour coded feedback. The mixer offers 4 channels with 3 band EQ and filters, plus exceptional 24-bit sound quality. Once again living up to Denon's name for crystal clear audio that we mentioned earlier. Oh, and did I mention that I love the Denon sound? No! Well I love the Denon sound!!! Another great feature is the touch sensitive needle drop above each deck, this allows you to easily search a track with a simple slide of the finger. 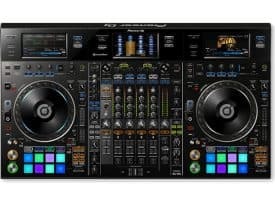 Just like the Pioneer RR above, and the Numark earlier, so who copied who?? I don't care it's still really cool. Overall a great controller suited well to mobile DJ's or more experienced DJ's. 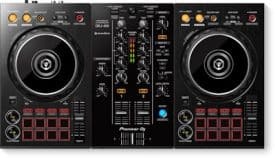 And with the double laptop option which is usually found on much higher priced controllers, it could make for entertaining club sets with two DJ's playing back to back! But I still wish it had built in effects! This really is the ultimate DJ controller. It gets my vote for the most feature packed controller, and the best DJ controller on the market. But it's still not stand alone! Come on Pioneer we want a stand alone controller so we can leave the laptop at home!!! But with that being said, this fully loaded controller has been designed with DJ's on the road in mind and is perfect for professional setups and mobile DJ's. As long as you still don't mind taking the laptop on the road with you *cough cough*. The controller is bundled with a free licence key for the full Rekordbox DJ, Video, and DVS software. Rekordbox video will allow you to play video sets and incorporate audio visual mixing into your sets! These videos can then be played directly from the controller and displayed on a screen behind you. Or anywhere else you chose to place a screen. You can build your own video using the software to create something that fits the party. It then reacts to the music or controller input. Or you could use the live camera input selection. This would really bring something different to your gigs and enhance the whole experience. The deck design is inspired by the Pioneer CDJ-2000NXS2 with its large jog wheels. These jog wheels are mechanical and pressure responsive just like the CDJ-2000NXS2. This means they will work from the pressure of touch, instead of working electrically like previous models. Some people like this, some don't, but I'm with Pioneer on this one, they feel great. This is a first for pioneer controllers and gives you a super responsive and totally different feeling jog wheel than before. The deck section also gives you familiar multicoloured performance pad design, and super high quality sound output. Almost as good as Denon! Really!! The 4 channel mixer section is designed with the DJM-900NXS2 in mind and is completely stand alone. This allows you to connect additional CDJ's, XDJ's or turntables via the phono inputs. This then allows you to incorporate DVS control, or even to play real vinyl. Mobile DJs will certainly appreciate the 2 microphone inputs with a full 3 band EQ control for the mic. You can also add effects to the mic which features a knob for full parameter adjustment. The DDJ-RZX has three 7 inch touch screen displays and resembles the cockpit of an F-35 fighter jet! Well almost. These allow you to see the same information as displayed on your Rekordbox software. So you'll be able to see your entire Rekordbox library with all of your track information. You'll also see waveforms, BPM counters, cover art, and more. You'll also be able to control loops, cue points, samples, and a massive bank of effects. This means you will be able to close your laptop and control everything directly from the hardware. But you still need that laptop and its software unfortunately. The feature packed DDJ-RZX is aimed at experienced or hard working mobile DJ's. It offers a tough design for safe transportation. The DDJ-RZX comes in at just under 16KG so heavier than most but still manageable by one person. The width is close to 1 meter so you'll also need more space than you do for the average controller. It's not cheap, but if you want the best DJ controller money can buy, this is it! This feature packed controller is another great option for the more experienced DJ or mobile DJ. This is my choice of the best DJ controller for mobile DJ's under $700. It uses as a simple plug and play system to connect to your laptop or computer and is ready go. The controller is built to work perfectly in conjunction with Serato DJ. The intro version of the software is included, and you can easily upgrade to the full version. The Denon MC6000MK2 also includes Serato video capabilities. This is why you'll see the mixer section includes a video button. This gives you the ability to switch between video, audio, or both. With this function you'll be able to control videos just as you would music, with the ability to mix, add FX, and even scratch the video. Now that's cool! Mobile DJs will love the 2 microphone channels with full EQ controls and a mic echo effect knob. And another great mobile DJ feature is the mic ducking function. This lets the DJ use the mic to easily and clearly talk over music. The volume will automatically lower to let you speak without shouting. Initially the mixer does come across as a bit cluttered, everything is a bit close together. If you're not careful you could push two channel faders at the same time. It may not be for you if you have big hands. But although it's cluttered, you'll soon notice it's a very well thought out layout. A 3 band EQ with gains, VU meters and 4 channels, below a crate navigation function makes everything very accessible. You can set loops, hot cues, auto sync, as well as fully controlling FX from the deck section. The jog wheels are very nice feeling and they look good too with the all silver design. They are quite small but this shouldn't bother most DJ's. Four rear line inputs will allow for DVS function. So you can connect your CDJ's or switch to phono for turntables to work alongside the controller. You can then use timecode CD's or vinyl to play in a more traditional manner. The MC6000MK2 weighs in at just 4.1 kg making it very transportable. But at the same time it's very well made and durable. Overall a great unit which should bring professional and mobile DJs many years of fun/business. Next up we have the tiny Hercules Instinct P8 which is purely for fun. But it's still the best DJ controller for $100! And possibly the lightest DJ controller weighing in at less than 1kg! It's so light, I felt like it might float away if I had let go! This is a very cheap option for people that are curious about DJing. And a good choice for those that don't wish to spend too much money until they are sure that they will enjoy mixing. It could also be great for people that have the odd house party, or to soundtrack birthday parties etc. The Instinct P8 comes in at less than $100 and offers great value to get you off to a start in DJing. It's very small at only 26.5 cm wide and you could easily carry it in a backpack to get to the party. It comes bundled with DJUCED 40 DJing software. And it offers a simple plug and play feature. This means you can easily connect straight to your computer/laptop using the provided USB cable. The deck section offers very small jog wheels, and I mean VERY small! But amazingly they give you the ability to scratch! It has 4 performance pads per channel, and play/pause, auto sync and cue buttons. The performance pads allow you to add up to 4 hot cues per channel, loops, and samples. There are no pitch control faders but manual beatmatching is possible by using the shift button in conjunction with the jog wheel. If you're new to DJing you also have the sync option to auto beatmatch. The 2 channel mixer offers a 3 band EQ with filters, a library browse knob, and more. Overall a fun little controller with more features than you'd expect from first impressions. Don't expect this controller to perform on par with other controllers in this review, it's been added for fun and as a very cheap beginner option. My impression is that the Instinct P8 is designed purely for one off DJ's playing at house parties. Or maybe undecided beginners, or people that just like a bit of easy mixing fun every now and again. You could probably even teach your kids how to mix using it. But for the price it's a fun little controller that will achieve the basics of mixing and add plenty of cool extras to your mix. Pioneer have released the much anticipated upgrade of the SX2 controller that featured earlier in this list. The SX3 is mapped for use with Serato DJ and comes with a few fresh upgrades. The upgrades include three microphone inputs that will be pleasing for mobile DJ's - just think DJ, MC, and karaoke without having to keep passing the microphone around. A mobile DJ's dream! It also includes a sound color FX panel, of which are becoming a standard for all top of the range Pioneer gear, with Filter, Jet, Echo, and Noise. These FX can be placed over the music or even assigned to microphones one and two. And as a bonus you can also assign any of Serato's effects to these two microphones. What's more there are also now two USB ports for swift and simple DJ changeovers, again a great feature for bigger gigs. This is a great little upgrade from the SX2, it's slightly more expensive but well worth the extra for these awesome upgrades. It's a controller that's certainly aimed at the serious mobile and working DJ's and it's sure to please the crowd. Check out my full review of the amazing Pioneer DDJ-1000 controller that's new for 2018! Click > HERE. Learn everything you need to know about becoming a DJ and progressing to a professional standard > HERE. You can learn everything you need to know about mixing > HERE. If you need help learning how to use your equipment then check out > USING A MIXER and > USING A CONTROLLER/MIXING DECKS. Good luck with your choice! I hope you find the best DJ controller for yourself and your budget with the help of this list..
Let me know what controller you chose below.